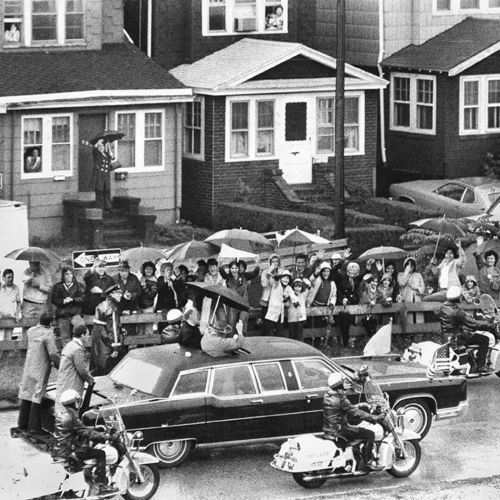 "Pope John Paul II visiting Queens in October 1979. As long as there have been popes, popes have needed transportation. Footmen used to shoulder his holiness on portable thrones, known as sedia gestatoria, to greet the public. But papal movers evolved with the times. The unofficial term #popemobile came into vogue in the 1970s with the creation of a series of white all-terrain vehicles with bubble tops. A Lincoln Continental was first customized with a clear folding top and a thronelike seat in the back for #Pope Paul VI's trip to New York City in 1965. It and later models were then modified by the coach-building company Lehmann-Peterson, which outfitted limousines with security features for presidents, dignitaries and rock stars. Photo by @nytimes staff photographer Paul Hosefros. #popeinnyc #tbt" By nytimes on Instagram.